FAQ-A007 : How should I connect iPhone/iPad to the audio system in a signal generation app? FAQ-A007 : How should I connect iPhone to the audio system in a signal generation app like "Audio Tone Generator" ? [Answer] Audio signal generation application can connect to audio system by the following method. (1) Output from 3.5mm headphone jack. (2) Output using Lightning compatible digital audio interface. (3) Connect with AirPlay using WiFi. We recommend to use the Lightning' connection in (2) since the digital audio output has the highest signal accuracy and is stable as the reference signal source. In addition, AirPlay in (3) has sound quality problems in the receiving equipment since it adopted Apple's proprietary wireless communication method. It seems to occur by wireless communication status, compatibility with connected equipment, and audio data compression algorithm. According to our user report, there is information that the sound via AirPlay may be interrupted momentarily the audio signal in the higher frequency band of over 10 kHz in the sinusoidal frequency sweep. FAQ-E006 : How to get the log data of "Vibroscope". [Answer] In "Vibroscope" measurement data and time information are saved in iPhone as log data (text format). This log data can be imported to PC by iTunes file sharing. - Connect the PC and iPhone with a USB cable. - Import log data from iTunes file sharing to PC. For more information on iTunes file sharing, please refer to Apple's official support site. [Answer] In "fo-Kannon", we have received some inquiries about microphone input from iPad's 3.5 mm earphone jack. We measured characteristics of our own microphone (SONY ECM-959V : sorry for a bit of an old microphone). Pink noise is reproduced from the speaker and it is measured by holding at the position of about 1 m in front of the speaker for 5 seconds. It was confirmed that the low frequency gently decayed. This is an example of measurement result including our loudspeaker's frequency response but it seems that it will not be a ridiculous characteristic even if it is a type of microphone inserted in the earphone jack. However, please note that the results will change depending on the characteristics and the impedance matching of your using microphone. FAQ-H004 : Since my ear is hard to hear, is there a suitable app for that? [Answer] "Listening Tuner" is a sound amplifier app for hearing support. There is a sound correction function that makes it easy to hear normal sound and ambient sound. It has left and right channel independent 8 band graphic equalizer that corrects auditory characteristics, noise suppression, bandwidth compression and Replay function which can hear again 15 seconds immediately before. However, it does not correspond to the music playback and video playback. Applicable app : "Listening Tuner"
FAQ-C003 : The app freezes during installation. The app does not start properly. FAQ-C003 : The app freezes during the installation. Remain in the state that the installation has not been completed. The app does not start properly. [Answer] Please delete the app and reinstall it. If the communication environment is unstable, the installation may be incomplete. Once the app was purchased, you can install any number of times downloaded from App Store. Applicable app : All iOS apps. FAQ-A002 : Reference level 0dB of "Audio Frequency Analyzer" (AFA) ? 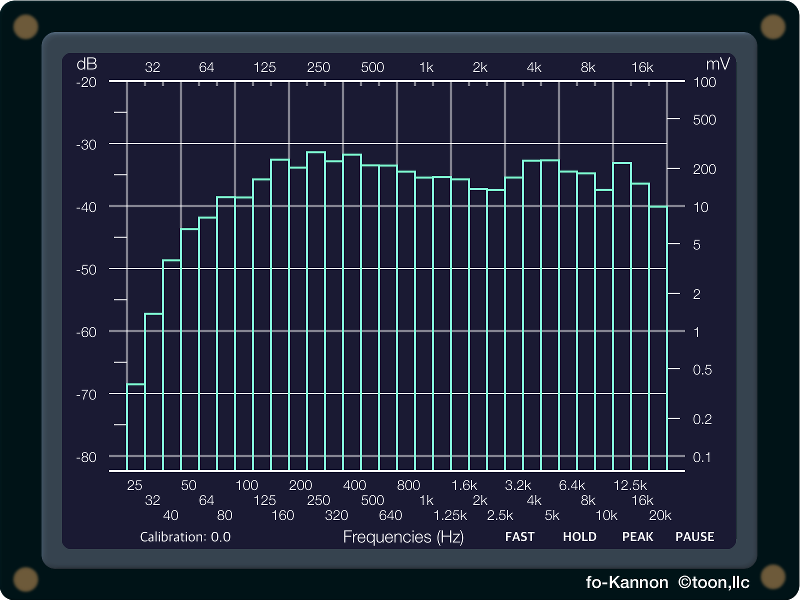 [Answer] In "Audio Frequency Analyzer"(AFA), the full scale of sine wave 1 kHz is set to 0 dB. This also applies to "fo-Kannon". In addition, the reference level of the general sound level meter is specified as sound pressure level 20 uPa (Pa unit is Pascal. minimum audible value) as 0 dB, which is different from the dB value measured by AFA. Applicable app : "Audio Frequency Analyzer", "fo-Kannon"
FAQ-C001 : No sound input. Measurement is not available. We will respond to frequently asked questions with our iOS app. FAQ-C001 : No sound input. Measurement display such as measured values and graphs is not available. [Answer] : For the iOS app that require sound input, it accesses the built-in microphone device. Scope of application :"Audio Frequency Analyzer", "Sound Level Analyzer/Lite", "Low Frequency Detector", "Noise Viewer", "Vocalise Scope", "Listening Tuner", fo-Kannon", "Onmon".